A to B Removals Aberdeen offers furniture storage and self storage facilities at our storage units and self storage containers facility in Aberdeen. Our storage facility provides the ideal storage solution for customers who need to store items whilst they are moving and relocating. At A to B Removals Aberdeen we have 3000 square foot of storage with 250 containers which range in size from 8ft, 6ft and 6ft=288cube feet containers and we also have 20 foot containers for smaller items. Your items will be kept in the best possible condition in our specially designed storage containers and storage units. Our storage containers are manned 24 hours a day by Security Guards and we incorporate a CCTV and Red Care alarm system to ensure your possessions are secure at all times. Putting your non essential items into our storage facilities provides the ideal storage solution to your removals process and helps to ensure your moving day runs as smoothly as possible. For our business clients, we provide office storage facilities for items such as archives, non-essential items and spare furniture. This can help with making the actual move as painless as possible, keeping interruption to a minimum and help to ensure the smooth running of your office relocation. 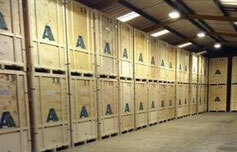 Call A to B Removals Aberdeen on 01224 213 336 or 01224 315 577 to discuss your storage requirements.